Martha's Favorites: PINK SATURDAY! ARE YOU READY FOR SOME PS RERUNS? So sorry about that, but I have been trying to decorate my home for Halloween and it got out of control. I have taken down all the summer things and I am still not finish and then bring out bins and bins of Halloween things. It's a mess, but don't you just love it? My husband has been feeling extra romantic so that puts a kink in the time line, a good one of course. He wants to be with me, so even my shopping has had a to take a back seat. I am back with a few prayer requests (Noah is sleeping). Please remember our dear friends as they have asked us to share their burdens. Seems you and the hubby have been doing a little pre trick and treating...lol I don't remember seeing any of this and if I did...it's OK..it's wonderful, especially that picture framed in the beautiful off white frame...gorgeous! Never saw them before in my life, so I'm loving them. But truth to tell, I love to re-read old magazines and books again that I love, so seeing beautiful pink treasures over and over wouldn't be a bad thing. I loved seeing these pictures.....my favorites are the plates! I loved seeing all your gorgeous pinks... The plates are just beautiful. Happy Pinks and have a lovely weekend. Martha, your post is lovely. The pinks you chose to share with us are beautiful. I hope you are having a wonderful day. Thank you for sharing your pretty pinks with us. Remembering all those with a special need. Oh Martha what a lovely post today. How wonderful for you to think of Amy thank you so much. God Bless you sweety. 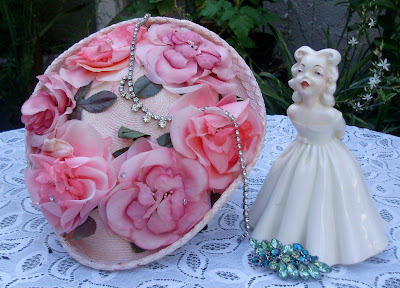 Pink rerun how fun I have never seen this one :0) beautiful items they are so gorgeous and elegant. Have yourself a wonderful weekend. Hello Martha. These are lovely and I agree gorgeous! Thought and prayers always for others. 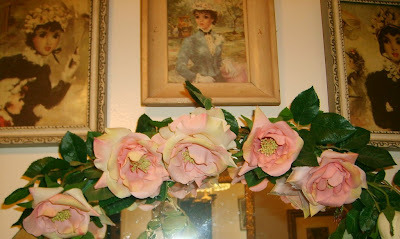 BTW I introduced your blog to my Pink Saturday post. Hope you like it. 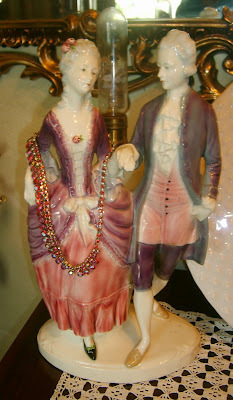 I love that colonial looking couple! Happy Pink Saturday! Your pinks are still pretty this time around! It sounds like you are having fun with the Halloween stuff, even it it is making a mess. I hope Noah took a long nap for you so you could get some work done! Happy Pink Saturday and have a beautiful weekend! 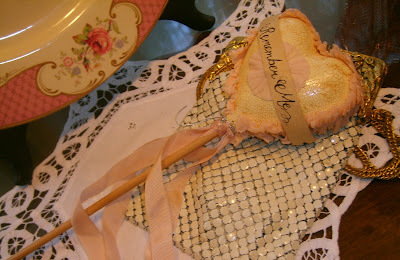 I am so pleased you stopped by to wish me a HPS.I love your blog first off...eye candy. 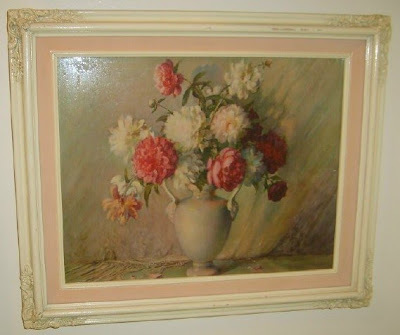 All your pinks are breath taking.The hat,and I love the painting of the roses.The figurines of Maria Antoinette,too beautiful.I also have grandchildren,as of August I now have 3...I too cant remember life with out them.We trully are blessed arnt we? Happy Pink Saturday to you. Im off to work,now...chat with you soon. You can never look at something too much! Especially if it is Pink! Thank You for sharing your Pinks! My Halloween stuff has taken over my house too! Lovely items and healing thoughts for those in need of prayers.